In my previous article, I had discussed on how to merge multiple files using Command Prompt. You can also use that tutorial to hide your private files by merging them with another format file (basically with rar format). Instead of doing that long programming, you can create a simple batch program to merge your text files. Once created, you can use it any number of time. Moreover, this batch program is a file so you can also share it with your friends or other colleagues. In this short tutorial, I will guide you how to create this program. Now copy paste below code inside it. echo Welcome to the program! echo Press enter button to continue! echo Press any key to exit! To save it, click on "File > Save As" option. Make sure to add ".bat" at the end of file name. It is the format of batch program and without it, your program will not work. Finally hit save button and that's it. 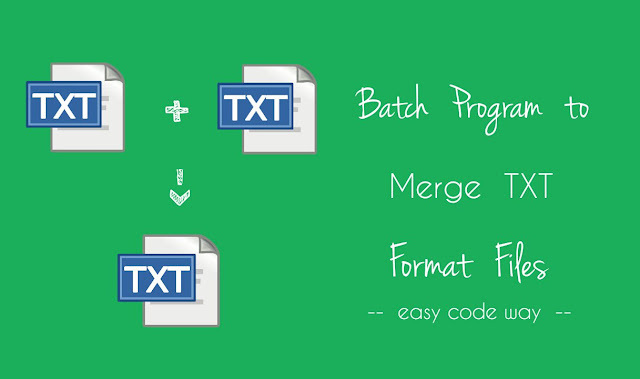 Now whenever you want to merge your text files, simply copy them and paste them in new folder. After that, move that folder to Desktop and open this batch program. Here username is your account name. You can find it by executing "echo %username%" code in new Command Prompt window. You can also specific the folder location manually by changing the above code. Next to this, it will ask you to type the name of new merged file. Just give it any name (e.g., "final-file"). Don't add file format at the end as I had already added it in the code. Finally press ENTER button and it will automatically merge all your txt files within second. To check the merged data, go back to the folder and open the merge file. Merging txt files will combine their text. For example, If you've two text files having "I love you" and "but as a friend" words then the new merged text will be "I love you but as a friend". This order can be opposite if the file containing "but as a friend" will come first. Then the new text will be "but as a friend I love you" (which is meaningless). Note: This batch program will scan your files numerically/alphabetically. You should arrange the files in the order of data that you wants after merging. This can be possible by renaming. For example, If you want to move any file at the top then, rename it to "1.txt" and rename other files to 2,3,4 and so on. This will automatically arrange them in your desired order. Actually this program is just for fun and it has very less practical use (speaking frankly, I had never used it before) but you can use it if you have bunch of text files and want them in an organized way. This part is for advanced users who are interested in batch programming and wants to know about how this program works. This is very simple (as simple as creating a new Hello World in C++. Yeah!). There are 3 most important commands in this program which are set, cd and copy. cd command is used to move the Command Prompt to a particular location. The basic syntax is "cd [address here]". e.g., "cd C:\Users\Username\Desktop"
On the other hand, copy command is used to copy one or more files. Here it will merge all txt files and then copy their data in new merged file. In above code, I had also used an asterisk (*) wildcard. Asterisk is used to select all items, no matter what their name is. You can find more about this copy command by executing "copy /?" code. color 9f - color command will change font and background color. title - sets the title for the Command Prompt windows. pause>nul - This will pause the screen until user press any key. exit - This will quit/exit the current window. Now I just hope that you've complete knowledge about this batch program and you can easily merge your text files. If you're facing any problem, feel free to ask me in comment box. What Is Facebook Jail? What to Do When Account Is Blocked? © 2015-2017 Easy Code Way, All Rights Reserved.